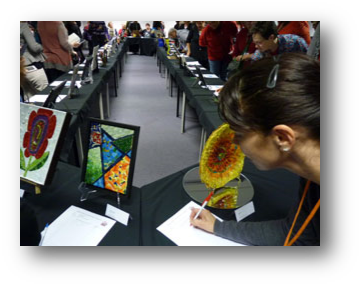 This exciting action-packed event gives Symposium attendees the opportunity to show and sell a small mosaic work, along with the chance to pick up a unique piece of mosaic art for your own collection, or to own a little something from someone you admire. Attending the salon is open to all symposium attendees but to exhibit in the salon, you MUST buy an exhibitor’s place. This year we have 45 salon places. They are allocated on a first come first served basis, so don’t miss out and buy your place when you register for the symposium. The piece must be mosaic and has to be 30 x 30 cm or smaller, but there are no other restrictions. You get to set your own starting price and are responsible for the sale yourself. MAANZ takes no commission. Registered salon exhibitors will be contacted by the salon co-ordinator Marian Shapiro and asked to submit details of their piece to her by July 15th, so you don’t have to have a finished piece in order to buy your place. In 2013, every single one of the 40 pieces displayed sold! For more information, see the FAQs document Salon FAQs. Registration for the salon will open on 1st April when the symposium registration begins.